A little while ago I wrote about the Quiver single pen holder, its design and the entrepreneurs who developed this excellent product for your Moleskine notebook. In this article I will have a closer look at the Leuchtturm1917 Pen Loop that allows you to clip your pen onto your notebook. In the picture above you can see the Leuchtturm1917 Pen Loop attached to the back-cover of a Moleskine notebook, while in the bottom area you can see the Leuchtturm1917 Pen Loop retail package (with installation instructions). This is a more detailed picture of the Leuchtturm1917 Pen Loop. You will notice the strong black hard plastic square with Leuchtturm1917 branding to which an elastic “loop” is attached (on the right). In the picture above you can see the peel-off-part of the adhesive backside of the Leuchtturm1917 Pen Loop. You simply pull off the yellow plastic and put it on the back cover of my Moleskine notebook. The Leuchtturm1917 Pen Loop does the job it’s designed for perfectly. I can attach the Lamy- and Rotring pens I use onto the Moleskine notebooks, so I won’t have to search in the large Timbuk2 Custom Laptop Messenger Bag. The elastic material used for the Leuchtturm1917 Pen Loop allows fit for a wide variety of pens and pencils (big and small ones). You can use the Leuchtturm1917 Pen Loop on a notebook, the cover of a binder or even the kitchen calendar. In my opinion this is a huge advantage of the Leuchtturm1917 Pen Loop. When the Moleskine notebook is full it is not possible to re-use the Leuchtturm1917 Pen Loop (without glue). Grab a Leuchtturm1917 Pen Loop for the great price point of € 3,50 at Writersplaza.nl ! Hey!, I found this information for you: "Leuchtturm1917 Pen Loop review". 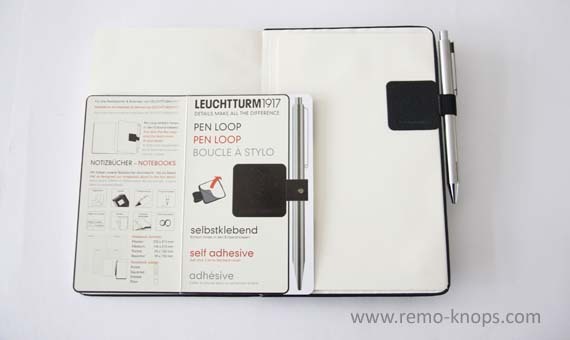 Here is the website link: https://www.remo-knops.com/3699/leuchtturm1917-pen-loop-review/. Thank you.